Live tour commentary is conducted in English by our friendly, highly trained andaward-winning tour guides. e-bikes, tour guide, bottled water. the Old City from its origins: you will be head to the Gothic city centre, where are the Roman ruins of the ancient Barcino, then you will move to the charming medieval district of El Born, where you will enjoy the marvellous Santa Maria del Mar Church (the “Cathedral of the Sea”), the narrow streets, the cosy atmosphere and much more. 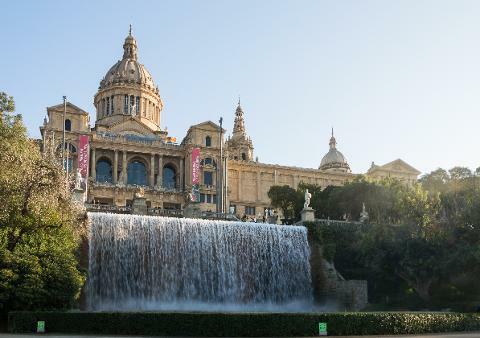 Then you will ride along the Port Veill to escape the crowds at Montjuic Hill, a peaceful park where you will be able to enjoy the spectacular views as well as explore the Olympic stadium and the Olympic Swimming pool. We will stop for a break watching Barcelona from one of the most amazing viewpoint of the hole city. Our tours are conducted on comfortable electric bikes, suitable from 12 year old kids (or 1.45cm tall). For smaller kids we have different options (trailers, child seats) so they can also enjoy the ride. Advised clothing: Comfortable walking shoes. Depending on the weather consider bringing sunscreen, sunglasses, hat, and waterproof outer layer.